Meanderings: I spent the weekend at a lacrosse tournament. 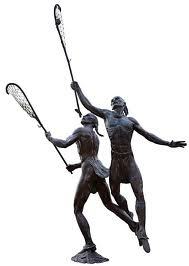 A game which hails its history back to the American Indians, lacrosse, a.k.a the Creator’s Game, is a very noble and intense sport which is taken quite seriously in my community. The Indian’s believed it to be a game which included a right of passage for players as well as a means to resolve tribal disagreements. Yesterday was a very long day – both my guys play lacrosse and all in all it was a total of 12 games…sunrise to sunset. There was some very serious competition going on, as many of the major public and private schools in the county compete for bragging rights. As the Fall Brawl goes, so is it a harbinger of the upcoming spring lax season…. I mentioned some several blogs ago, my sons transferred from their school of many years to a new school – and one of the many reasons for the change was to play at a higher level of lacrosse. Well, as things would have it, in our fourth game of the day we played against our previous school. I will be honest, this game was personal. My sons dearly wanted to win and win big on this one….and I was right there with them in that sentiment. As it turned out, their team tent was placed right next to ours. How ironic. We were “tourney neighbours” with friends and schoolmates who we’d been in community with for many many years. In fact, their new coach had been offered jobs at both our old school and our current one…and had chosen to take the job with them…. Crooked Paths: As game time grew closer, I found myself chatting with the coaches and former athletic director, whom I will call Adam. We of course had a “friendly” discourse over who would win…I said in a snarky tone, “When we win, you can have my shoulder to cry on…” Adam reminded me about his high hopes for their growing program, the newly seeded fields, the desire and passion of the new athletic director and on an on…that rhetoric just raised the anti. The game started out and they were stronger than expected. Our team looked flat and were moving in slow motion, it seemed. I was actually surprised at the other team’s defense and the goalie was solid. It took our team awhile to get into the rhythm of the game…but we finally did, with my son scoring 2 of the multiple points that led to a very solid win. Yay! He was happy, our team was happy and I was happy. But a strange feeling started to creep into my heart after the game… I tried to ignore it – after all – we had won and I was buoyant about it….right? Well, I must say it was an odd feeling to be “on the other side” of the community I had embraced for so many years. Too, I found myself feeling bad for some of the players, some of whom were school mates to my kids growing up. One of them had even played for my husband in youth league. What an act of generosity… Smack dab in my face… Adam’s humble spirit reminded me what humility looked like and I was convicted all the way down to my toes. It may seem a small gesture, but if you had looked into my heart about an hour before, you would have seen how puffed up it was….and how out of tune with what God would want in me. Straight Paths: I thanked my friend for his comment and found myself thinking about the Proverb that speaks to heaping coals into one’s own lap….and I remembered that humility is something God wants to cultivate in us all. As we draw closer to Him, it should be more a part our character as we seek wisdom (from God) and grace (to and from others). In God’s Word, we are told that humility is the opposite of pride. Antonyms for humility are: arrogance, assertiveness, egoism, pretentiousness, and self-importance. Hmmmm….feeling a little convicted again. Proverbs 11:2 When pride comes, then comes disgrace, but with the humble is wisdom. Psalms 149: 4 For the LORD takes pleasure in his people; he adorns the humble with salvation. I first watched lacrosse games in high school in andover. Interesting sport. didn’t know that part of its history. It is a fascinating game, and takes multiple levels of skill as well. I wish i could pick up a stick and play as well! I am wondering when you mention Andover, are you referring to the town? I have family there! I am enjoying your blog too. Blessings on your efforts!